The glove box light turns on when the tail lights are on. Keep the glove box closed. 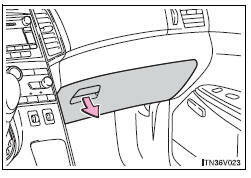 In the event of sudden braking or sudden swerving, an accident may occur due to an occupant being struck by the open glove box or the items stored inside.